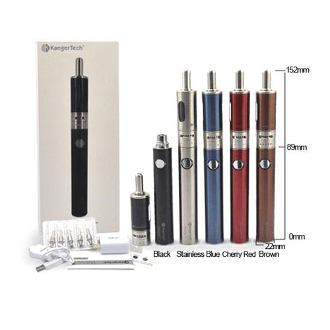 The Kanger EMOW Mega Starter Kit is consider to be the best electronic cigarette and the latest in the Kanger line and is a revolutionary variable voltage starter kit. The EMOW Mega Starter Kit comes equipped with a state of the art EVOD VV (variable voltage) battery 1600 mah and Kanger EMOW Mega tank. Along with these top notch e-cigarette components, a number of other great e-cigarette accessories accompany this great kit. The EVOD VV (variable voltage) battery is a powerful 1600mAh Lithium Ion battery that will give you days of vaping between charges. Another great trait of the EVOD VV battery is its variable voltage feature. The EVOD VV has a dial located on the bottom of the battery that allows you to raise and lower the voltage with just a turn, from 3.2v to 4.8v. The EMOW Mega tank from Kanger is a dual coil, bottom feeding glass and stainless steel tank with an adjustable airflow control valve. The Airflow valve is made up of a series of holes cut into the base with a stainless steel ring. Turn the ring to uncover the holes to regulate how much or how little air you receive. These tanks are also rebuildable with removable head coils for easy maintenance. Screw the battery into the USB charger. Plug the USB charger into the USB port of the EGO USB Wall Charger. Do not leave the battery on the charger once it is fully charged. Doing so can cause damage to your battery and may cause it to malfunction or not work at all. Note:We advise you to only use our batteries with OUR chargers. Different companies use different voltages in their chargers specifically to go with their own batteries. So when mixing companies products you run the risk of damaging your battery and voiding the warranty. IMPORTANT! Never leave your batteries unattended while charging.